The Stanford Cardinal celebrating their win at the 97 Regional win against Georgia. 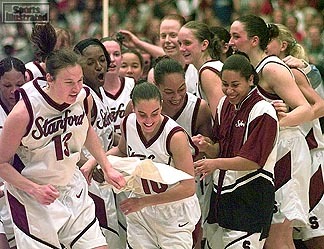 This site covers the current 97-98 Stanford Women Basketball team. Also it will cover two of its best players in the past years: Kate Starbird and Jamila Wideman. This Week: Stanford (6-5, 3-1 Pac-10) looks to rebound from a last-second loss to Arizona as the Cardinal travels to Los Angeles to face USC on Friday, January 16 and UCLA on Sunday, January 18. The Cardinal split games last weekend, defeating California, 72-52, and then falling in Arizona, 91-90, on Monday. Stanford's loss to Arizona snapped a 48-game conference winning streak, dating back to February 4, 1995, when the Cardinal lost 78-73 at Oregon State. The 90 points scored by Stanford against Arizona was the most points put up by a Stanford team in a losing effort, surpassing an 93-87 overtime loss to Cal in 1981. Stanford in the Rankings: Stanford is ranked 11th in the Associated Press Poll and 14th in the USA Today/ESPN Coaches Poll. The Cardinal has been ranked in the AP Top 25 every week since the beginning of the 1987-88 season. Neither UCLA nor USC are ranked. Injury Report: The Cardinal will be without Naomi Mulitauaopele for the rest of the 1997-98 season. She had off-season surgery on her right patellar tendon that has not fully healed. On Thursday, Janruary 15, she will have surgery to repair the area of her right infrapatellar tendon that has not healed from the summer surgery. She does have a redshirt season available to use, but she is exploring the options of using her redshirt season or playing professionally after graduating in June. Scouting Report - USC: The USC Women of Troy bring a 6-7 overall record and a 1-3 conference mark into Friday's matchup at the Lyon Center. USC is led by Chris Gobrecht in her first year at the helm of the USC program. Goebrecht returned to her alma mater this season after a one-year hiatus from the Pac-10. Goebrecht was the head coach at Washington for 11 years, before leaving for Florida last season. The team has been bitten by the injury bug with a variety of ailments affecting different members of the squad. Kristin Clark currently leads the team with 15.2 ppg and 2.8 rpg. Stanford leads the all-time series 19-15, with the Cardinal winning the last seven consecutive meetings. Scouting Report - UCLA: The UCLA Bruins bring an 8-5 overall record into this week, before playing California on Friday. In the conference, UCLA is tied for second in the Conference with Stanford with a 3-1 mark, after winning three consecutive games over Arizona State, Oregon State and Oregon. The Bruins have faced a top schedule, falling to North Carolina in overtime and defeating Duke in mid-December. Sophomore Maylana Martin leads UCLA with a 21.0 ppg average and 8.2 rpg. Last season, Martin was the Pac-10 Freshman of the Year and is currently third in the Pac-10 in scoring and is first in the Conference in free-throw percentage (.791). Head Coach Kathy Olivier is in her fifth year as head coach, but her 12th season at UCLA. Stanford took the lead in the all-time series, 18-17, last year with victories both in Los Angeles and at Stanford.